The indigenous Assyrians are a small, weak and oppressed people. The Assyrian statehood or a permanent security for the Middle East’s indigenous Assyrians under a plan recognized and enforced by the international community has been repeatedly undermined by the powerful few states that have dictated the political map of the world post WWI, at the League of Nations in 1932, at the United Nations post WWII, and recently by US administrations and their European allies post 2003 US invasion of Iraq. The claim to re-establish historic Assyria has the legal foundation and historical justification. As indigenous people, the Assyrians’ right to autonomy and self-government was proclaimed in the United Nations Declaration on the Rights of Indigenous People adopted in Article 4 of the 107th Plenary Meeting of the United Nations on Sept 13, 2007. (1) The roadblock is neither legal nor historical. The establishment of Assyria is rather a complicated political endeavor intertwined with the intricate politics of the Middle East. That they are overwhelmingly Christians surrounded by a sea of oil-rich and empowered Muslim world. That they were forced to share their historic lands with the continuous influx of nomadic non-indigenous Kurds. That the Kurds are supported almost unconditionally by Israel and other powerful states. That Israel has its own ambitions in the historic Assyrian region. The Assyrians must redefine who they, their friends and allies are and force the transformation of their psyche since they have passionately defined themselves as Christians at the expense of their ethnic belonging, or have not united under their historic ethnic name as they allowed unethical and selfish leadership to undermine their unity. Consider the fact that the Kurds are predominantly Muslims: mostly Sunni and some Shi’aa; however, when the media and world leaders refer to Iraqi groups, they would say Shi’aa, Sunni, Kurds and Christians or they would say Arabs, Kurds and Christians. Why not say Muslims and Christians or Shi’aa, Sunni and Christians or Arabs, Kurds and Assyrians? Why not refer to all groups religiously or refer to all of them ethnically? Why refer to some groups religiously while others ethnically? The Kurds have worked very hard to impose their ethnic belonging over their religion of Islam. The Assyrians existed before Christianity was born – Christianity is our faith today, but being Assyrians is who we always were. One of the main setbacks with the Assyrians is that they revere their clergy beyond reason and have allowed decisions regarding national matters to channel through the church despite a century of national awakening. It almost feels like all national decisions had to be blessed and/or approved by the high clergy. The separation of Church and State seems almost impossible. What adds to the devastating situation is the fact that most church leaders have international or regional obligations or debatable ties to the same enemy that is undermining, oppressing and persecuting the Assyrians. Furthermore, the profound denominational struggle between the various Syriac-speaking churches and their respective leaderships continue to deplete the Assyrians’ energy and cause any cooperation or unity efforts to be aborted at infancy. Many intellectuals see it unfortunate, adversarial and unfavorable that patriarchs play significant roles in the Assyrian national affairs. Patriarchs are expected to foster that magical environment to enable and facilitate harmony and cooperation within society. And whereas they are considered as the representatives of God on earth, patriarchs, therefore, must exemplify that holy image of God on earth through their humbleness, spread of love, sound decision making and behavior. It is regretful and frustrating that they have exercised the contrary. There were several positive efforts for unity or cooperation between the Syriac-speaking churches; unfortunately, they all remain mere photo sessions between church leaders. Meanwhile all unity statements and declarations remain practically promises unfulfilled. Since my family has been historically a member of the Mother Church of the East, I will concentrate on the affairs of the leadership of the Assyrian Church of the East (ACOE). 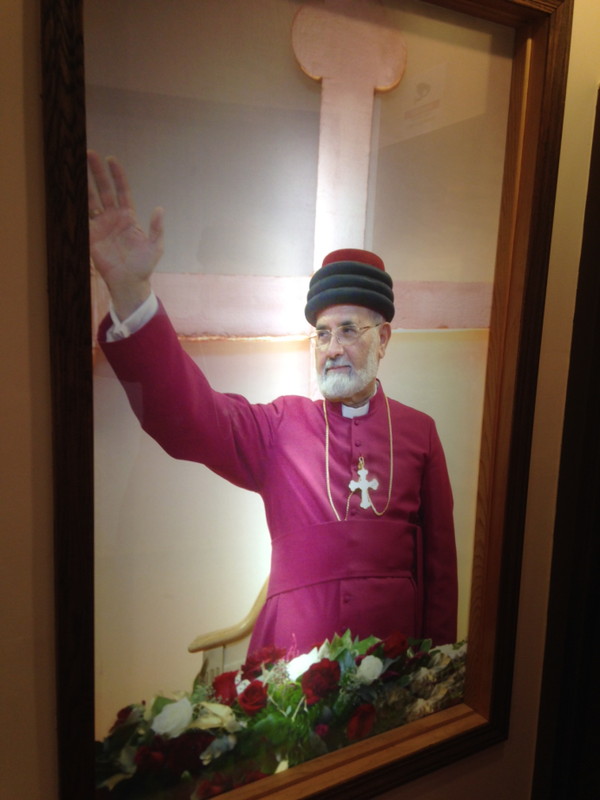 The late Mar Dinkha IV served as patriarch from 1976 until 2015, a catastrophic period during which the Assyrians witnessed an intensified exodus parallel to that of World War I. This flight has been due to the 1980-1988 Iraq-Iran War, 1991 Gulf War, 2003 US invasion of Iraq, Kurdish leadership’s methodical oppressive policies in the last 40 years and finally the 2014 barbaric storming of Assyrians’ heartlands by the Islamic State of Iraq and Syria (ISIS). The emergence of ISIS at this time, its strength, who financed it, which governments were behind it and all other related matters is a topic for another article. Mar Dinkha had claimed repeatedly that he had not gotten, and that he was not going to be, involved in politics; however, he did it habitually and frequently. We do not have to look far since the circumstances of post 2003 US invasion of Iraq suffice. Mar Dinkha relentlessly praised Masoud Barzani, president of the Kurdistan Regional Government (KRG) despite repeated oppressive policies by the Kurds and the KRG against the ethnic Assyrians in northern Iraq. 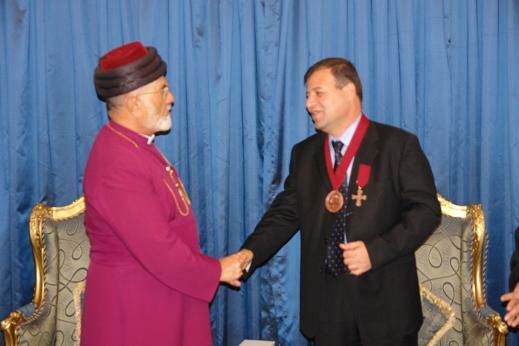 Furthermore, Mar Dinkha bestowed two medals on Sargis Aghajan, a fellow tribal man. Aghajan was a high official of the Kurdistan Democratic Party (KDP) and the founder of the newly established al-Majlis al-Sha’bi (The People’s Council) that ran in the 2005 and the subsequent Iraqi and KRG elections. The sole purpose for establishing this Kurdish backed group was to undermine and diminish the popularity and positive influence of the Assyrian Democratic Movement (ADM). Thus, contrary to what Mar Dinkha had claimed repeatedly in his speeches, he was clearly involved in political matters. Many political leaders in the third world countries and throughout the Middle East plan their survival through population control which relies on propaganda and the latter in turn relies to considerable extent on visual stimuli. These leaders display their mega sized pictures and portraits throughout their respective countries. They use visual stimuli and other means to gain the support of those they rule and specially the vulnerable youth who are the future. One wonders, why would patriarchs follow in the same path of those state leaders and have their mega pictures all over their parishes. During my visit to Chicago very recently, I was bewildered by the many images of Mar Dinkha in the various Assyrian parishes. The teachings of the Church of the East prohibit displaying images of humans in churches. If displaying a picture of the church leader is advised, then it should be a picture of an appropriate size placed at a more conspicuous location. Furthermore, the ACOE has for the last three years a new elected patriarch, Mar Giwargis. 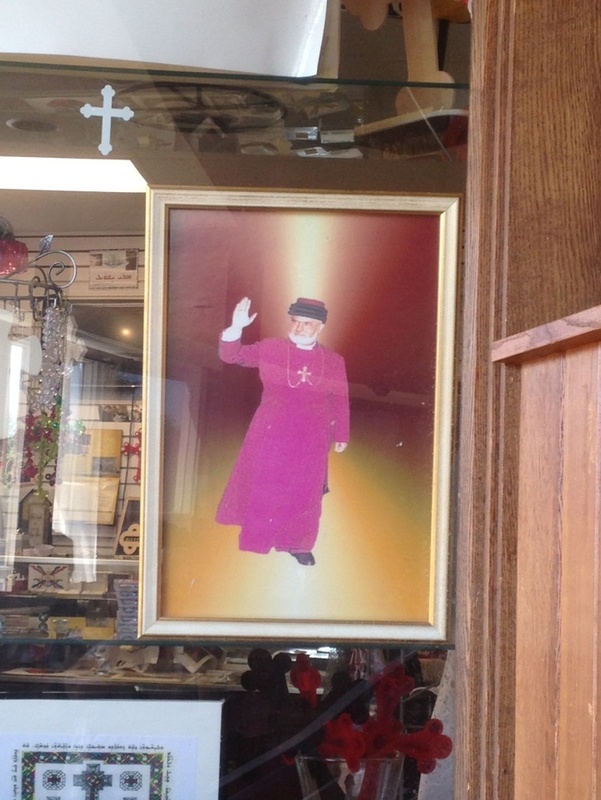 If so, why are the pictures of the departed Mar Dinkha still all over the churches? 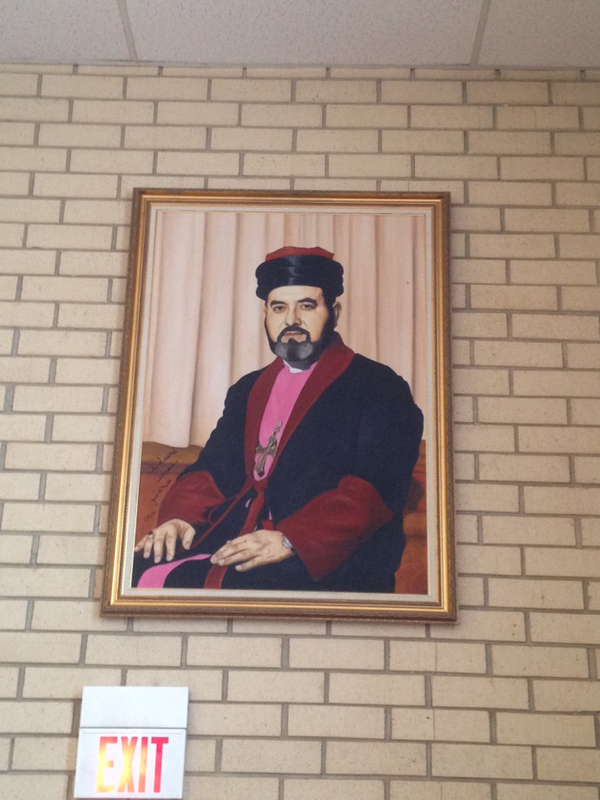 At Saint Andrews Church in Glenview, Illinois, there are multiple pictures of Mar Dinkha on display. 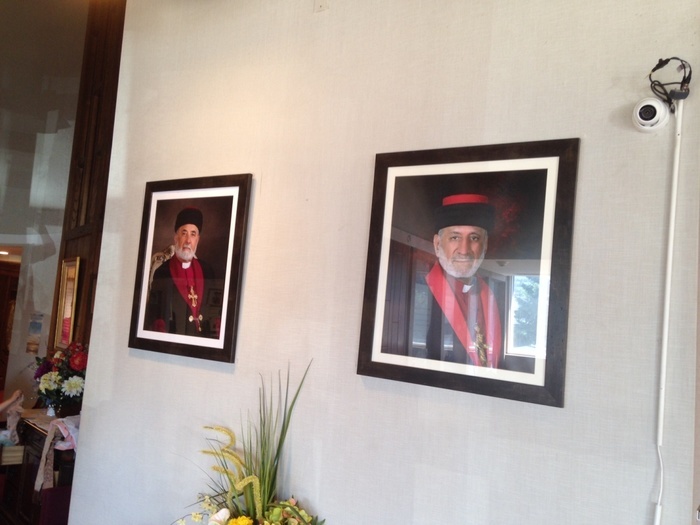 One picture of him and another of the new patriarch are side by side as one looks up when entering the church lobby. Another smaller framed picture of him is to the left as one attempts to take the steps up to the lobby. Few steps further in the hallway, there are two mega pictures of the late patriarch waiving; one is facing the people as they are entering the church itself and another as they are leaving. The two different poses are facing each other behind beautifully framed glass. Few argue that these pictures are not inside the church, rather in lobbies that are not part of the actual church. This justification is amusing. The Bible tells us that when Jesus visited the Temple in Jerusalem, where the courtyard was filled with merchants and tables of the money changers, he drove them all out of the temple and said, "Take these things away; do not make my Father's house a house of trade." Jesus did not say, oh, this is fine since these merchants are not inside the temple rather they are in the courtyard. The lobby is still part of the church property. Furthermore, the question remains, what is the purpose or the hidden intention from displaying all these large pictures of a departed patriarch. Then there is a marble headstone outside Saint Andrews Church. The headstone has inscriptions indicating the dates of Mar Dinkha’s birth and death and the years of his service as patriarch of Seleucia-Ctesiphon See. Few of the late patriarch’s loyalists have begun to pray at the site thus paving the road for others to do the same. 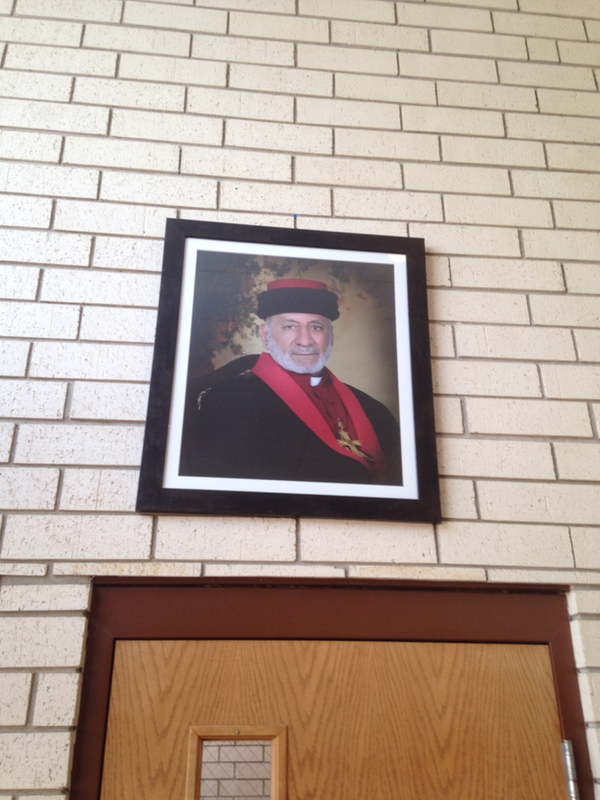 Meanwhile, at St. Mary’s Church, in Roselle, Illinois, a large picture of the late patriarch is on the wall to the right as one enters the church lobby. 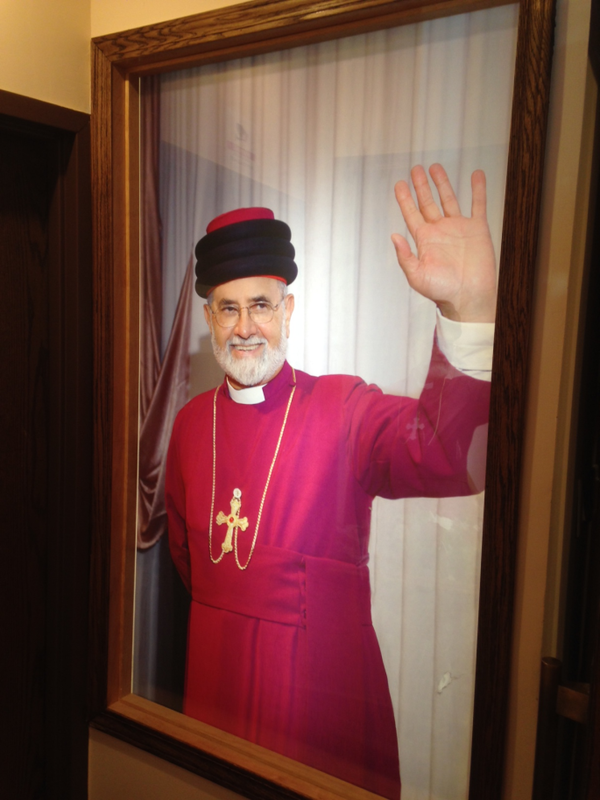 Meanwhile, to the left, a smaller picture of the new patriarch Mar Giwargis is in display. 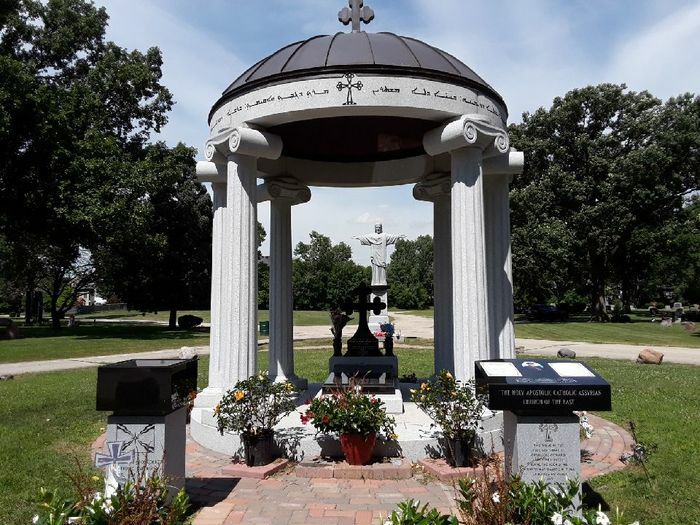 Again, if we were to display pictures of any past or departed patriarch, why not then display the pictures of all the rest of the departed Assyrian patriarchs of whom many have given even martyrs within their families to the Church and people. 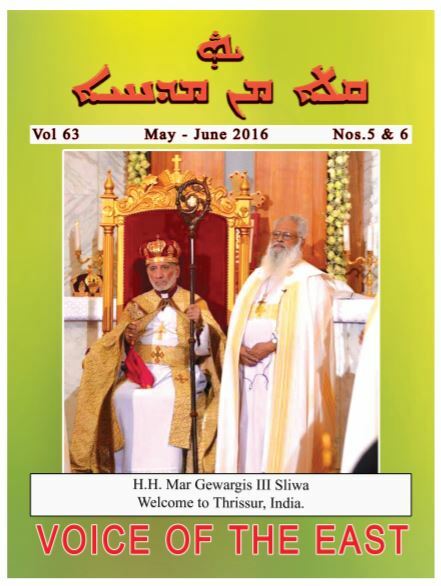 Furthermore, why are the pictures of a departed patriarch larger than those of a sitting patriarch? What is the message here? This continues to be the theme in many of the churches that I visited. Mar Dinkha’s apologists argue that Mar Meelis’s outrageous statement was a personal action and that the patriarch was not behind it. This defies all rules of a structured institution. If the patriarch disapproved of such speech, then some kind of a disciplinary action should have been taken or at least an apology should have been issued by the church. Many church analysts argue that the patriarch had no control over his bishops and that his hands were tied. This argument reflects previous stands towards other bishops. The emergence of reports regarding a relationship between Mar Aprim Khamis and a Pakistani woman Yasmin Khan, the exchanges of thousands of dollars between the two and the subsequent court appearances rattled the faithful. A synod convened in June 2001 and handed the bishop a mere temporary suspension of duties with full pay. Many were expecting the bishop to be defrocked or banished from the church based on the Church Canon Laws (Sounhadous). (4) Mar Aprim later assumed his full duties as the Bishop of Arizona. 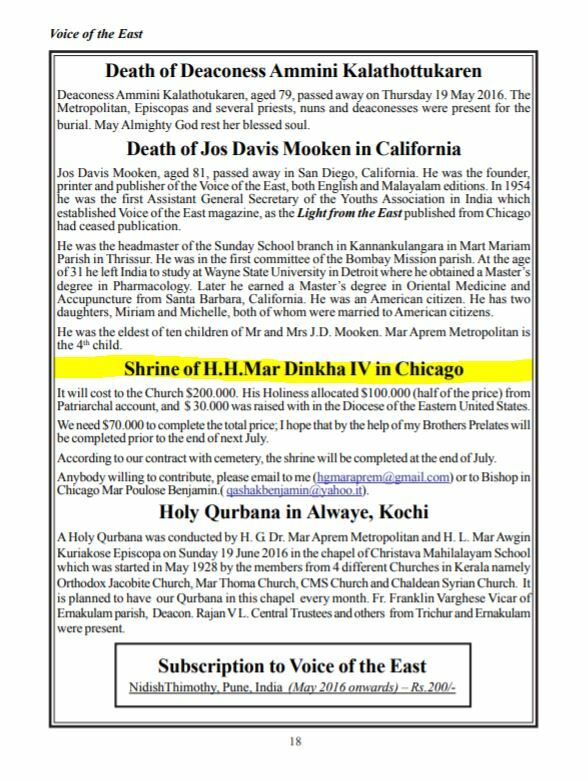 Mar Dinkha and Mar Aprim were the only remaining bishops active and alive when Mar Aprim’s involvement with Mrs. Khan became public. Analysts argue that Mar Dinkha avoided confronting his bishop due to fear of repercussion from the bishop as both were actively involved in the insalubrious and illegal events from that turbulent 1973 – 1975 period. On July 15, 2007, Mar Dinkha celebrated his fifty years of priesthood with a ceremony where a portion of Ashland Avenue in Chicago was renamed "His Holiness Mar Dinkha IV Blvd". This was planned and executed while the patriarch was still alive and in office. The patriarch led in person a large musical parade to celebrate the event. 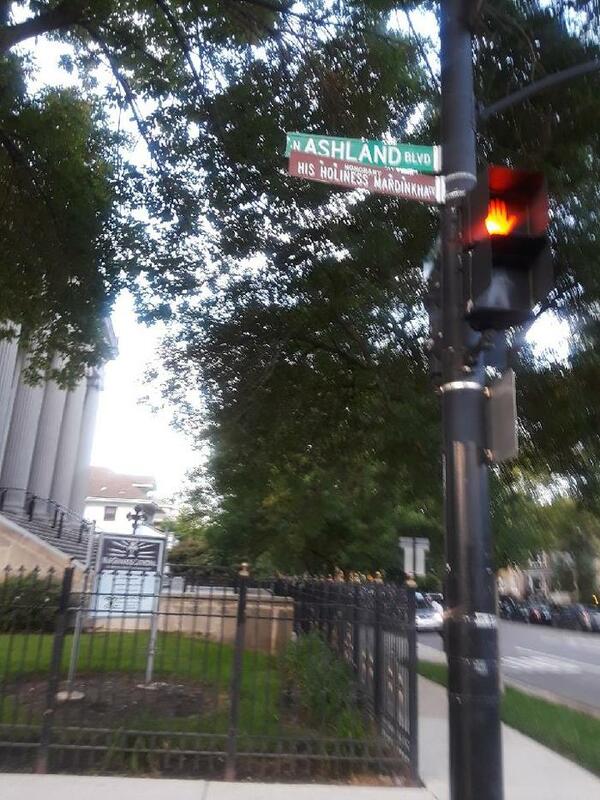 Other communities in Chicago, such as Hindus, for example, were honored by naming a section of Devon Street as Ghandi; however, Ghandi has been dead for a long time when his honoring transpired. Furthermore, Mahatma Ghandi was a very educated leader of a powerful country, who accomplished enormously for India and who throughout his life promoted peace and humbleness. Let’s also consider the resting place of Mar Dinkha and the substantial designated land area around it. This mega site has cost the Assyrian Church of the East (ACOE) and the Assyrian people $200,000 so far. Out of this total, $100,000 came from the personal patriarchal account and $30,000 was collected from the Eastern Diocese of the church. 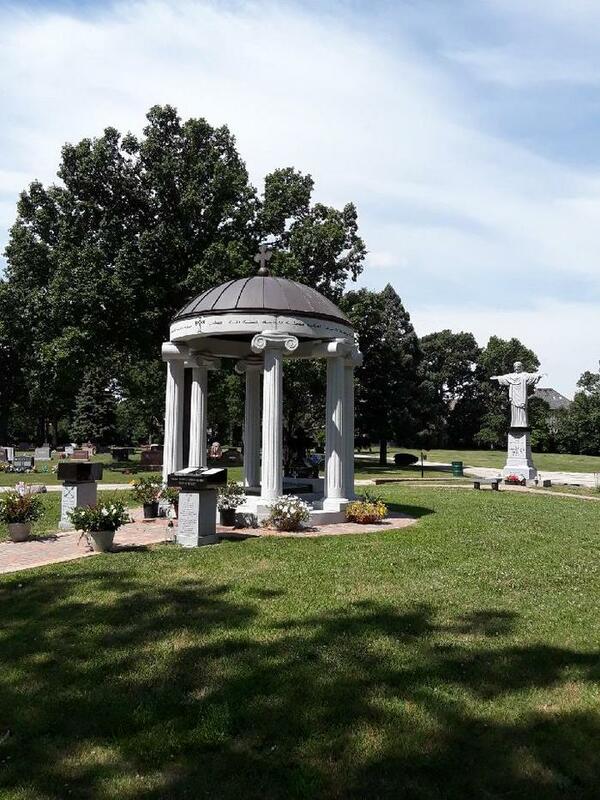 (7) The Church Committee in Chicago had sent letters at the time to other parishes throughout the United States requesting donations to secure the remaining $70,000. This was taking place at the same time as the Assyrian refugees from Mosul and the Nineveh Plains had fled the wrath of the Islamic group ISIS and were flooding refugee camps and sites all over northern Iraq. Furthermore, the diocese in California was about four and a half million dollars in debt. By the way, more recently and after the passing of Mar Dinkha, the California diocese had sold the priest home in San Francisco and the Church building in Seattle and raised more than two million dollars to pay down that huge debt. Few argue that Mar Dinkha had no control over his final resting place. The majority of the people that I consulted argued the opposite. The patriarch had already set a precedent when he allowed, and participated in, his own lavish annual birthday parties and anniversaries, when he allowed a street to be named after himself while he was still alive and then went out in person to celebrate it, when he allowed his mega pictures to be displayed all over churches and finally consider the $100,000 for the grave site that came from the personal patriarchal account. 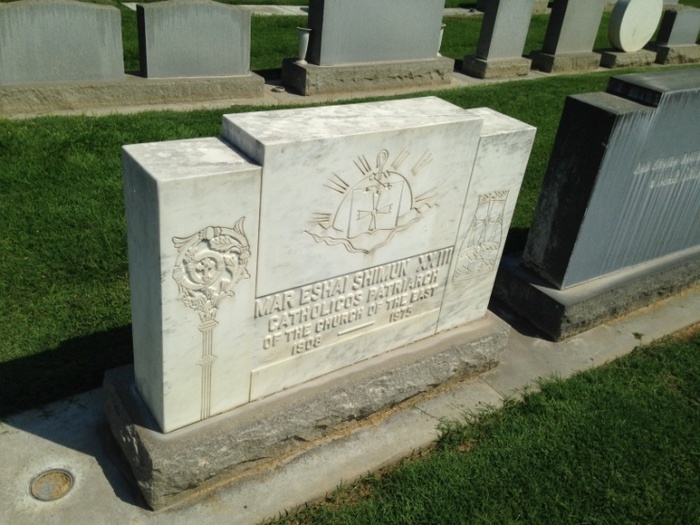 A much unadorned grave of the previous Patriarch Mar Eshai Shimun in Turlock, California is shown below. 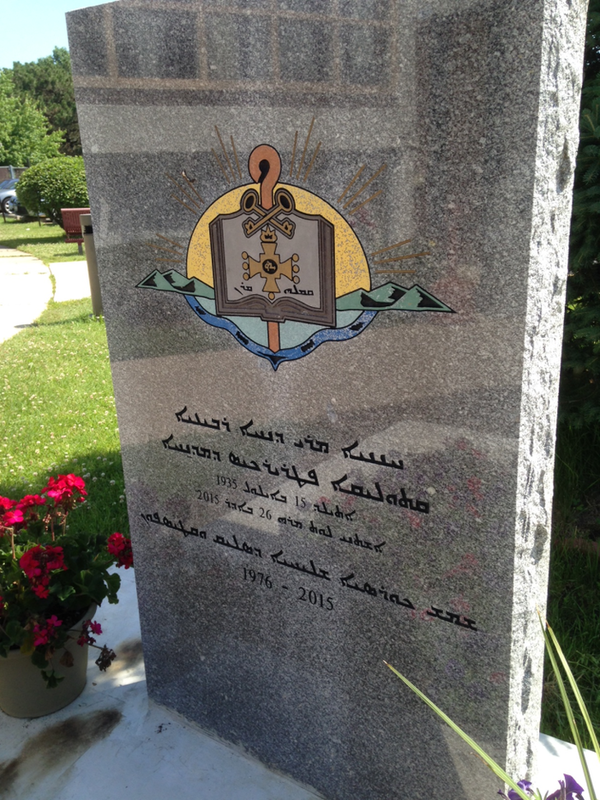 The headstone of the exiled and later assassinated patriarch includes inscriptions in Assyrian on one side and English on and the other side. The headstone is of the same size and height of the neighboring graves. There is no doubt that patriarch Mar Dinkha was carefully planning his legacy – a legacy that would secrete many setbacks, failures and a divided church. The photo sessions and declarations were plentiful, but not fruitful. The late patriarch relied on his close advisors and empowered tribal loyalists to achieve what he had planned. 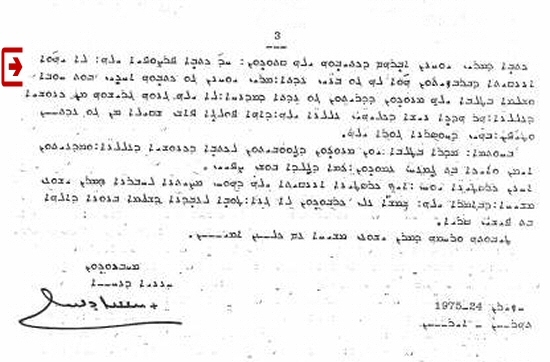 He openly supported his own tribal politicians, such as Sargis Aghajan, Romeo Hakkari, Fawzi Hariri, Fraidon Darmo, Cristo Yalda, Nenif Matran Hariri, and many others despite the fact that these individuals were members or strong supporters of the Kurdistan Democratic Party (KDP) and the Kurdish cause. Additionally, his personal Secretary, Rev. Antwan Lachin was from his own tribe as well. This strong knit of tribal loyalists will continue to build Mar Dinkha’s legacy now that he is departed by keeping his presence alive via those visual stimuli, continue to celebrate his birthdays, anniversaries and perhaps pave the road for his sainthood, as rumors are floating already. Researchers argue that religion might provide social cohesion, harmony, and positive relationships between and within members of the same group. Unfortunately, our religious leaders have opted to practice the contrary and promote the immoral behaviors of division, betrayal, selfishness and hatred. We the people have allowed this to continue due to our veil of ignorance and because of our religious conservatism and the nature of the Assyrian home and its relationship to church. To follow the teachings of the Bible and the fear of the so-called living in the afterlife hell have generated considerable adverse affect on the Assyrians. This led to the unreasonable affection to the persons of the patriarchs or bishops – an affection that is as close as it could get to worshiping and idolizing them. This in turn has created a congregation that is passive, weak and reluctant to criticize clergymen or stand against corruption, mismanagement and irresponsibility in the mother church in general and more particularly within the traditional Syriac-speaking churches. It is unfortunate and sad to see that despite of a century of existence in the Diaspora, the majority of the Assyrians still seem to be lost in the in-between mentality of that of religious and tribal against that of spiritual and nationalistic. History will not be kind to patriarchs Mar Dinkha IV, Mar Emmanuel III Delly, Mar Ignatius Zakka Iwas and Mar Louis Sako. The latter as a bishop for example was emphasizing “without unity, there is no future for us." Yet, upon his election as patriarch, he practiced the opposite. These patriarchs played devastating roles in the last few decades and have led to the almost disappearance of Christianity and the Assyrians from Iraq and Syria, their ancestral lands as they acted selfishly for the benefits of their own denominational crowns and gave in easily to regional and international persuasions or affiliations. What would it take for the Assyrians to cast away the old cloth of primitive religion? Europeans have colonized the historic Assyrian lands and pined one religion or group against the other. They have injected a disease almost incurable among the groups they colonized while reaping benefits for the greedy corporations they served. From 18th Century colonialism to 20th Century Capitalism to the modern era of International terrorism, the Europeans and later the Americans have continued to exploit, extort and inflict harm on the indigenous populations they ruled. The faces of the perpetrators might have changed, but the victims remain the same. Wars in the name of religion will continue to spring up in the Middle East. The Assyrians will continue to suffer the most due to their small population, the division among their denominations and political groups. Thus, their forced migration and exodus will continue. The Assyrians must change their behavior, stands, and mentality. They must create a healthy, open and progressive environment between all their religious, civic and political groups to metamorphose from the caterpillar slimy stage that they have been in for the last few decades and into that beautiful butterfly, otherwise the greatness that was Assyria will never re-blossom and will be lost forever. Fellow Assyrians, let us not be tribal, let us not be denominational, let us not be hypocrites, let us not be selfish, let us not be narrow-minded and let us not look the other way when something is done wrongfully. Mother Assyria is calling upon us and we must help her by standing tall and firm, because truth alone will set us free. It is time for the silent majority to rise up and put an end to the recklessness and selfishness of the few, regardless to who they are.